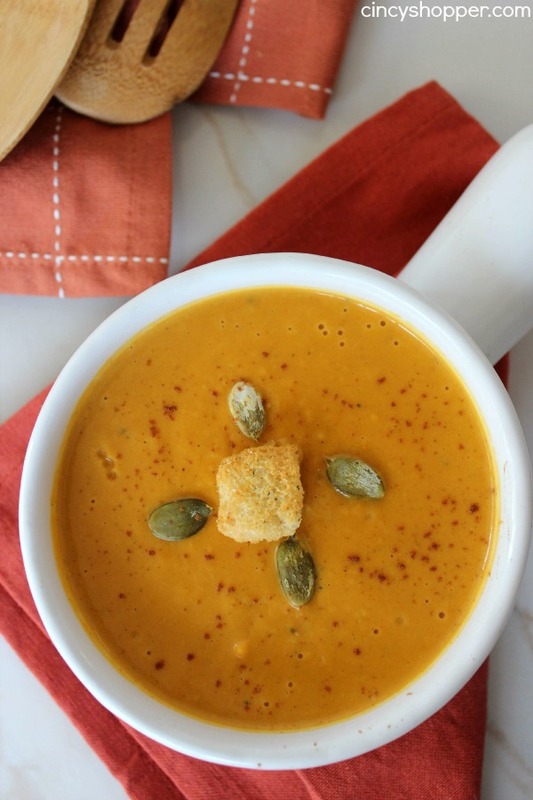 If you are needing a perfect fall soup recipe, this Copycat Panera Autumn Squash Soup is going to be perfect. Soup during the fall is a staple in our household. I purchase cans of soup for the kiddos to make a quick lunch with and also make some soups for the family to enjoy. I shared quite a few soups with you last fall like our Slow Cooker Bean Soup and also our Copycat Panera Broccoli Soup too! 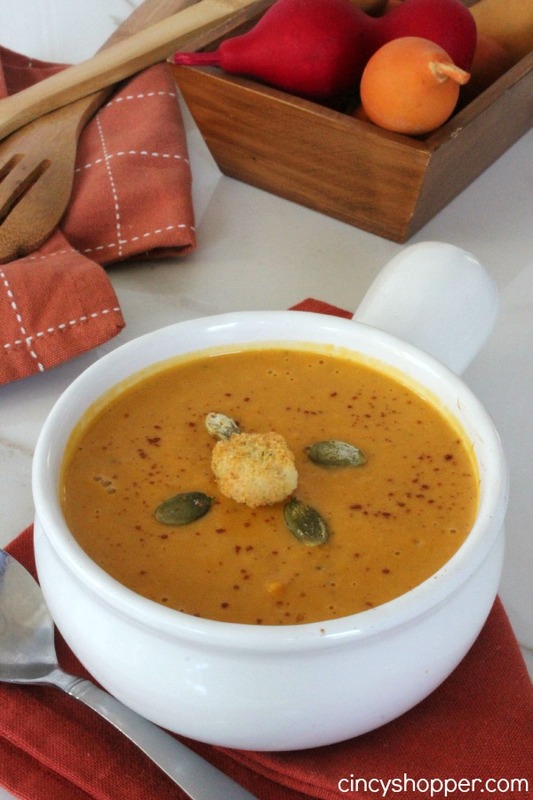 This CopyCat Panera Autumn Squash Soup was “Over the Top” delicious! I think I told all of my friends and extended family how tasty it was and how they would NEED to make this soup this fall. I have enjoyed Panera Autumn Squash Soup at Panera a few times in the past with a side salad. I just never thought to make it on my own at home. My hubby is great with copycat recipes so I had him make this one for us. He took a trip to Panera and immediately decided to make his copycat version after tasting all the flavor profiles. I will now be enjoying Autumn Squash Sup at home and saving some $$’s. 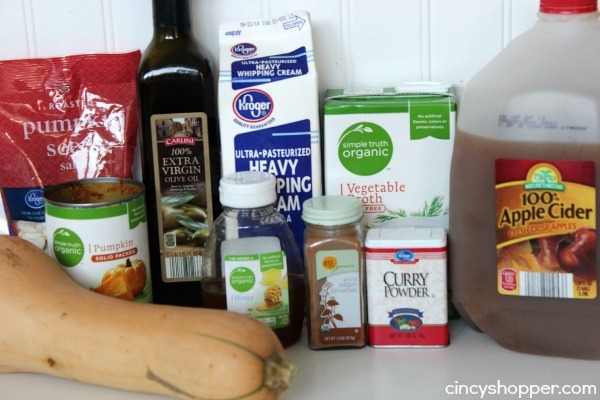 The ingredients you will need to make your Autumn Squash Soup are quite simple. I grabbed a small Butternut squash while shopping at Kroger and I had everything else on hand in my pantry. So this soup was quite inexpensive. Thanks. love that soup. How much squash? It’s as if you read my mind! I have been ordering this soup every time we go to Panera these last few weeks. And I thought to myself, I wonder if someone has a recipe out there? And then I find you on the link up! Thank you and your husband so much for sharing! Your Squash Soup looks delicious, wish I had it right now. Hope you are having a fantastic weekend and thanks so much for sharing this awesome post with Full Plate Thursday. 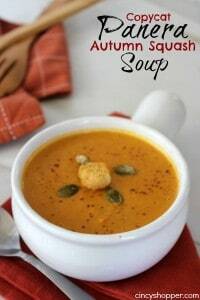 That is deliciousness in a bowl love this fall soup, with lot of flavors most importantly with curry powder. My weakness. Thanks for sharing with Hearth and Soul blog hop. pinning. Thank you so much for linking this delectable soup last week! I featured it in this week’s linky! Have a delicious week! 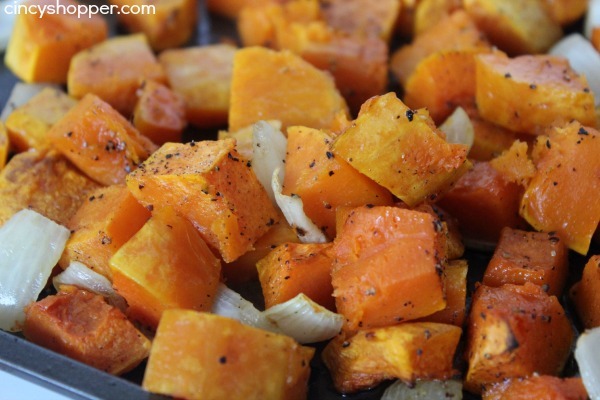 Roasted peeled apples with the squash & onion instead of apple cider. Added a bit more veggie stock to account for lack of cider volume. Used half & half instead of whipping cream. Absolutely divine! I like the idea of roasting apples with the squash and onions. How many apples did you use and how much stock? Made this last night it was delicious however I thought it was alittle sweet so next time I will use less honey. This sounds delicious!! Going to try it this next week! Thanks for sharing. Would it work to use 2% milk instead of cream? I would use canned evaporated nofat or skim milk. It is very thick and creamy without fat. I’m wondering if I could throw the chunked squash and diced uncooked onion w/ all but the cream into the crockpot and use an immersion blender after cooking all to add the cream and purée it all. What do you think? Had this at Panera and searched for a copycat to make for Thanksgiving. I found this and made it a week ago. Yummy and a big hit with the family. Just wondered if you ever have tried to copycat the Panera pumpkin muffins? My family loves them and I can’t find a good or close match to them (from all the recipes I have tried.) Thanks. QUESTION: I’ve been eating the Panera soup for the past week. I am fairly certain there is grated apple in it. The bits are not onion or raw squash. What does everyone else think? I am addicted to Panera’s autumn squash soup! I agree with Pam. However, the grated apple MUST be a very small amount. I tried this recipe (doubled) and found it to be too sweet, with too strong an apple cider flavor. Maybe I will try halving the cider called for and adding one small grated apple for the pot. And maybe a bit less cinnamon? I wasn’t aware that there was ANY cinnamon that I tasted in the original, and I felt the cinnamon was too noticeable this time. Still trying to tweak it, but thank you so much for the great start of this recipe! It’s a delicious time of year to taste test different versions! I am completely addicted to Panera autumn squash soup so I tried the copycat recipe but I found that there was to much pumpkin and it was just too sweet altogether. I took out half of the soup from the pot and added another whole squash to it and added more curry than what it called for with some white pepper as well. It came pretty close to tasting like Paneras but isn’t quite there yet. Any other suggestion? Just made it tonight for dinner! It was delish! Can’t wait to eat it again tomorrow! I made this last night and it is delicious! Do you think this will freeze well? You can freeze pumpkin and butternut squash so should not be a problem. I buy extra from Panera before they stop making it for the season, always intend on freezing it, BUT never makes it to the freezer! So GOOD! I love Panera Autumn Squash soup ! I just made cincyshopper,s recipe. It is delicious and taste’s just like Autumn squash at Panera. Thank you. Thanks . Love that soup. How big a squash? I am curious too about how many servings are made from the recipe. Thanks! I just made this and its absolutely delicious! Once I added the curry powder, apple juice and cinnamon, I did not feel like I needed the honey. To me, the curry powder makes the dish. Excellent balance of flavors. Furthermore, I substituted the heavy whipping cream with coconut cream…AMAZING!!!! Thank you! Just made this recipe and mine turned out too apple-y (it’s a bit overpowering) :( I’m going to try to add more squash and see what happens. made this tonight us by a large butternut squash. Even with the extra squash (so extra vegetable stock and cream) it was too sweet. Added extra curry and cinnamon accordingly, and almost on point but still a bit in the too sweet side. Li think next time I’ll stick to 1/2 cup cider and see how that goes, but not a bad starting point. I used only 1/2 cup of the cider vinegar and it still seemed like to much ( and I love cider vinegar) I’m going to start with even less next time and add more if needed. I believe the recipe calls for Apple CIDER, NOT apple cider VINEGAR. Apple cider…not apple cider vinegar. I made this tonight for my book club and found out it makes 8 servings. Delicious recipe, everyone really enjoyed it. Amazing, until I added the apple cider vinegar! Really think about cutting it out or only putting in a bit. It was apple cider. Not apple cider vinegar….. Excellent Autumn flavors. I used two roasted apples as I had no cider, chicken broth (no vegetable broth), almond/coconut milk (no heavy cream), and added a garnet sweet potato for color . It’s great. The apple cider flavor was overwhelming. Never mind!!! Thank God I did misread this recipe. Been awhile since I’ve had such a major cooking Fail! Apple cider does not equal apple cider vinegar. ?? Just did the same!!! omg I’m horrified with myself. So disappointed that it didn’t turn out for me :) I doubled the recipe but only halved the onion and yet the onion flavor was very overpowering. I didn’t even taste the pumpkin, butternut or apple cider. Won’t make again unfortunately. Made this tonight. It was delicious!! Did you actually try this in a blender, because it didn’t work for me. It was way too thick to blend. I had to add a lot of the broth to get it to even blend all, and then I had to keep stopping the blender and pushing it down with a spoon – which turned out to be super messy and only a little bit effective. I would skip this recipe if you don’t have a food processor. The onion threw off the taste… Not as sweet or savory as Panera. This soup was delicious. 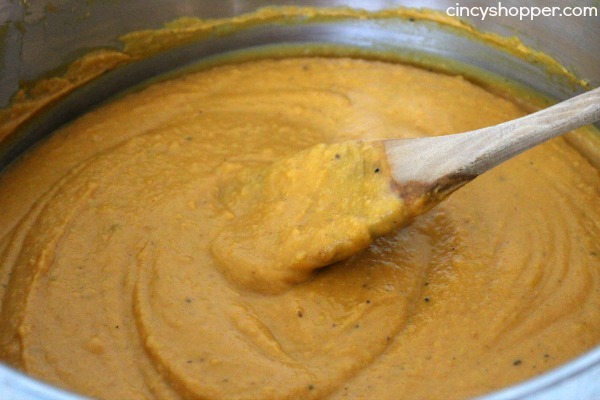 I’ve made a few squash bisque recipes and this was by far the best! I forgot the cider so I used more vegetable broth and it still tasted great- the spices and honey added just enough sweetness. Will be making this again soon for sure! I need to restrict sugar and dairy, so I subbed unsweetened apple sauce for cider, coconut milk for heavy cream, and increased broth to about 3 1/2 to 4 cups rather than 2. I took this soup as my contribution to a pitch-in Thanksgiving meal. Everyone loved it **I am a transplanted Yankey to the deep, Deep South…they do not “cotton” to Paleo down here so their compliments were taken to heart. Great recipe. I added a couple sweet potatoes to make it thicker. I couldn’t find the curry powder because I live in a very small town, but it still tasted good. I’ll have to try it with the curry powder as soon as I can find it! My boyfriend and I have made this twice and it has been fantastic with the colder weather. We are both novices at making soup, so we love the simplicity and deliciousness of this recipe! Thank you! This is my favorite soup and I look forward to it every fall. I’ve often thought about making my own version, but haven’t tried yet. Thanks for sharing this at #HomeMattersParty I’m definitely going to try your version!!! Hey, Jen! 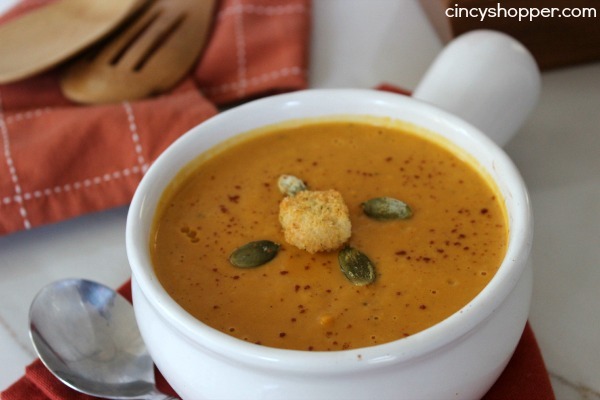 Just wanted to let you know that we loved your Copycat Panera Autumn Squash Soup Recipe so much when you shared it at the #HomeMattersParty last week, we’ve FEATURED it THIS WEEK! Hope you can check it out when you get a sec. Happy Friday!!! #1 Great recipe! Couple of notes/modifications. Apple CIDER. NOT Apple Cider VINEGAR. #4 Use a sweet onion, mine was more small to medium sized and you could taste the onion more than I would have liked. #7 If you can’t get a bread bowl, definitely just read up a piece of sour dough – SOOOOO GOOOD!!! Just made this soup exactly as written. Oh my goodness, it is divine! I wouldn’t change a thing! I love Panara’s Butternut Squash soup. I am sad to say, I was made this after dreaming about it since I found this recipe. I felt the soup was way too thick. I may be able to salvage it and give it a second try if I added perhaps another 2 cups of vegetable broth. Hi Phyllis! I am sorry to hear the soup was not something your cared for. Additional vegetable broth will work to thin your soup down. Great recipe, almost identical to Panera. Not sure why so many found the cider overwhelming, I coulnt even detect it. I think Panera’s is MUCH SWEETER. Save yourself some time and forget peeling the squash. Cut into manageable sizes and just cut the skin off with sharp knife as you’re cubing pieces. The processor I used didn’t quite purée it enough so I ordered an immersion blender JUST for this recipe. Turned out excellent though, great taste, pumpkin seeds add a bonus!